As of writing this post, 26 days before year 2013, Nokia Philippines announced their Year-End Blowout 2012. Nokia will be giving away 2 Million worth of prizes. They will give 12 weekly winners of P15,000 and 6 winners of Php100,000 in the grand raffle draw and one of ten (10) VIP tables on New Year's Eve at Eden, Republiq, 7th High, Skye or Vudu. Nokia already announced the twelve (12) winners each week from frist to fourth week in their official Facebook fan page. So grab the chance to be one of the weekly winners or yet to be one of the winners in the grand raffle draw. 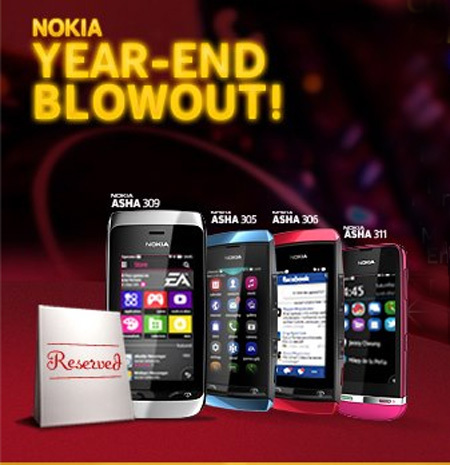 In order to join in their promo, just simply buy one of the Nokia Asha Smartphone such as Nokia Asha 305, 306, 309 and 311. Then keep your receipt so you may use it to register on the Nokia Year-End Blowout Facebook fan page. Once you get completed, your entry will be automatically included to the weekly and grand raffle draw. Don't forget to buy Nokia Asha Smartphone within November 3 – December 14, 2012 only. Visit their Facebook fan page for more details. Comments or suggestions about "Nokia Philippines Year-End Blowout 2012 - Nokia Asha Smartphone Promo" is important to us, you may share it by using the comment box below.